To see quality acrobatics, stilt walking and fire breathing, you’d have to find a circus. However, anyone who visits Gettysburg doesn’t have to go far to see some professional clowning around. Gettysburg is getting goofy with Lance and Connie Tarbox-Windish. The duo, also known as the Gettysburg Goofballs, is telling stories in the best way they know how, through comedy and performance art. Lance and Connie got their starts in New York City where she was president of a theater company and performed, directed, designed costumes and taught for 20 years, while he was a traveling entertainer and actor for 20 years. Additionally, Lance toured with Cirque du Soleil and the Ringling Brothers as a clown. Connie taught at, and eventually oversaw, a multi-location afterschool program for kids interested in performing. Education became a base of what she did. “When we met, we bonded over the love of theater and circus,” said Connie. After leaving New York City, Lance and Connie came to Gettysburg where Connie’s mother owned the Battlefield Bed & Breakfast which is where they work when they aren’t entertaining. The Gettysburg Goofballs is unlike any other business in the area. They’re storytellers, circus entertainers and educators all in one. The Gettysburg Goofballs works with adult and student groups. Their performances are highly adaptable to meet the needs of individual groups and they can incorporate their wide skillset into the story the group is to be told. “The circus background can be put into any context. Acrobatics can be tailored to a lot of different things and the needs of people,” said Lance. The Gettysburg Goofballs is looking into how they can expand even further in the community to partner with other businesses to further enhance the visitor experience. During evenings, anyone can visit the Battlefield Bed & Breakfast to listen to Lance tell ghost stories by the fire. These ghost stories are family friendly and incorporate the silliness of the Gettysburg Goofballs and the dramatics of traditional ghost storytelling. With a town full of storytellers, the Gettysburg Goofballs is telling their stories in a unique and physical way. 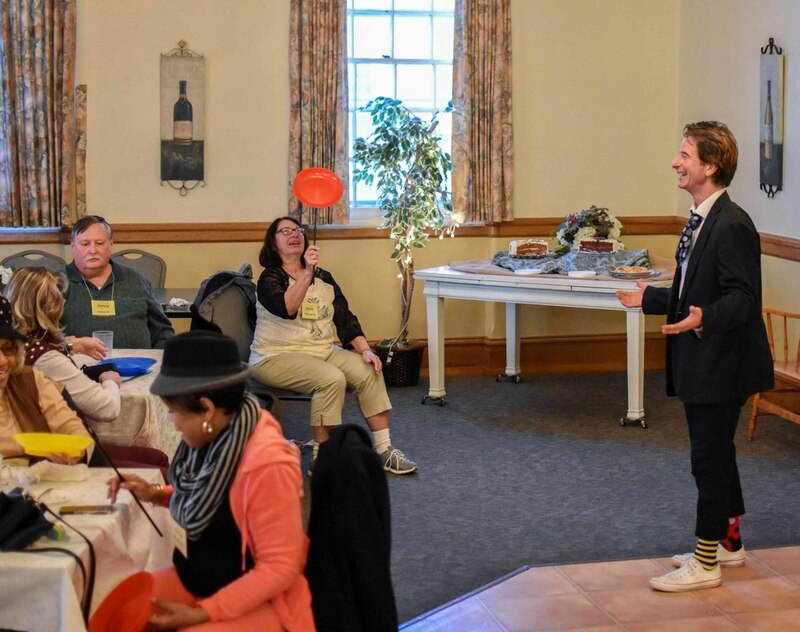 In the near future, the Gettysburg Goofballs plan on expanding what they do to include murder mystery parties and escape rooms when the summer season picks up. 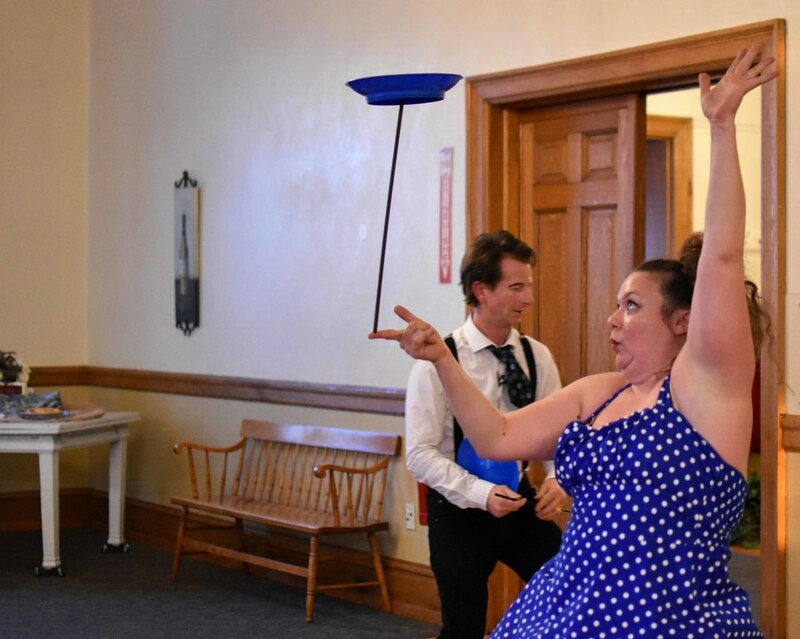 The Gettysburg Goofballs, in addition to entertaining visiting groups, also offer circus lessons and team building activities for groups and do birthday parties and corporate events near and far.